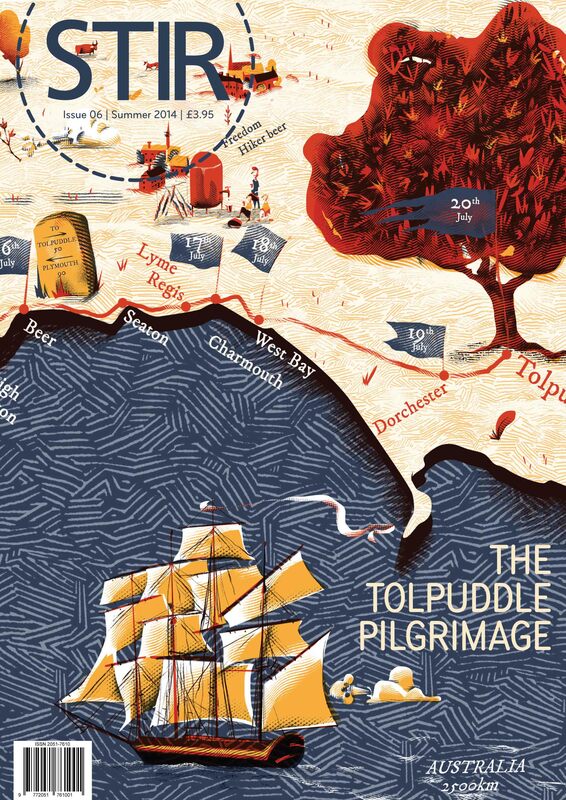 Our Summer issue is a special commemorative issue for the Tolpuddle Pilgrimage, a 10-day walking festival of alternatives — a tramp through the Great Transition! We’re walking from Plymouth Harbour, where the Tolpuddle Martyrs returned after receiving pardon, all the way back to this year’s Tolpuddle Martyrs Festival. We have events every night at the community farms and co-operative projects creating a new geography of hope in the South West of England. We’ve specially brewed a craft beer — Freedom Hiker — with our local brewery Gyle 59 and we also have many participating artists and sculptors creating commemorative art works and milestones along the route. The 4-page festival programme is the (removable) centre spread of this issue and features our illustrated map by Edd Baldry and all the information about our work afternoons, evening events and how you can take part! We’ve also got a a new illustrated map of Ruth Potts’ Radical Walk around Totnes by Gemma Cotterell. Ruth will be weaving her radical walk — walking around Totnes’ history of popular rebellion — into our pilgrimage on July 12th before we leave for Occombe Farm, Torbay. Also in this issue we have an interview with French philosopher Frederic Gros, who looks at the philosophy of walking through the quiet persistence of Gandhi and other philosopher-walkers. Steph Bradley, who will joining the pilgrimage as a storyteller, reflects on the relationship between storytelling and walking. We feature new social enterprise Snact whose fruit jerky is tackling food waste as well as powering our pilgrims. The Mayor of Frome, Peter MacFayden, writes about his new book Flatpack Democracy that looks at his experience of the Independents for Frome take over the town council and the challenges along the way. John Stewart uses his climate column to look at the environmental underclass and the contemporary relationship between the climate movement and the labour movement, and Ludovica Rogers reports back from Ouishare on how collaborative networks and the commons is presenting a new alternative economy. We take another personal look within a co-operative and this time it’s Kika Sroka-Miller from Zed Books who shows how horizontalism can be an important part of the publishing industry. And staying with the co-operative movement, activist Josef Davies-Coates looks at how Multi-Stakeholder Co-operatives could intersect the interests of workers and consumers at the same time, and also an article on the celebration of Employee Ownership Day (July 4) by Andrew Harrison and the campaign to raise awareness amongst owners and employees that employee takeovers are a viable and far more efficient way of running a business. We have a story by Gavin McGregor from Palestine that looks at how conservation and national parks can be used to prevent evicted inhabitants from returning and how the plants of an area hold long political secrets. Plus we’ve got a Q&A with walker-writer Robert MacFarlane! Artists in this issue include Edd Baldry, Gemma Cotterell and Graeme McGregor.